Two recipes for a light, plain cake, perfect for people who are planning to fast on Yom Kippur, the Jewish Day of Atonement, this week. Both cakes are suitable for preparing you for a fast, and also for celebrating afterwards. Most cultures prescribe some kind of fast and self denial. When I lived in Russia, people observed the Orthodox Christian Lenten fast, avoiding alcohol, meat and dairy in the 40 days before Easter. Now in the Middle East, I’ve become familiar with the rituals of the Muslim holy month of Ramadan – from one new moon to the next, 30 days of not eating or drinking from dawn till dusk. In Judaism, there are a handful of fast days which (relatively) few observe and one fast day which a large number observe, dusk to dusk, 25 hours. And then there’s “therapeutic fasting”. It’s very strong in Germany, where the leading hospital in Berlin offers supervised fasts of up to 2 weeks. You can also pay a bit more and go to a dedicated fasting clinic in Germany (with a Costa del Sol sub-branch) for long stints of fasting a la carte. Since it's a magnet for celebs, there you can meet Spanish royals and Sean Connery, and journos writing the place up for the Daily Mail. And then there’s that other religion: the 5-2 Fasting Diet. It’s an easy faith to explain. Eat as little as possible (and not more than 500 calories for women, 600 for men) for 2 days a week, and eat normally the other 5 days. And watch the weight drop off. I hadn't heard of it before my last trip to Sydney, where it was all the rage. I was working over at the ABC in Ultimo, where it seemed that whole floors were doing it. “They’re very grumpy on their fasting days, and I want to say – why don’t you just eat something, you'll cheer up!” an exasperated colleague said. But I told her she wasn't allowed to complain, because she’s naturally thin. Loads of my friends were doing the diet, and a journalist mate went to London to interview 5-2 guru, Dr Michael Mosley. For added impact, my friend went on a 4 day fast at the same time. “I was clear-headed and working throughout,” he said, with the fervour of a convert. For Jews, it’s not about health. It’s about a day devoted to the spirit, remote from earthly considerations. It's a day of reflection and atoning for your sins, for the faithful believe that on Yom Kippur God weighs your good deeds versus your bad and decides whether to write you in the Book of Life for another year. It's a big issue, none bigger, really, so people put up with a fearsome fast. No food, of course, and no water either. Nothing, nada, nil by mouth for 25 hours. Yom Kippur in Israel is incredible. The whole country stops. There is no work, no public transport – even the airport shuts down – no cars, no TV, no radio, no newspapers. Pollution levels drop. Children ride their bikes on empty highways. And the quiet! It’s almost audible. You walk on a street usually full of traffic and all you hear is the AC from nearby buildings. The village where I live is pretty quiet at night anyhow, but last Yom Kippur when I went for a walk at night I heard people talking to each other inside their homes. Must have been like that in biblical times. When the dogs or jackals howled - they hadn't got the memo - it made you jump. With fasts come special foods. There are certain dishes and desserts that are prepared only at Ramadan, for example. These days, Jews favour a big celebration at the end of the Yom Kippur fast. The American tradition of a huge break the fast public party has taken off in Australia, where it’s increasingly a social event. A large table is set with traditional starters such as chopped liver, avocado salad, egg salad, and hummus, as well as noodles, often baked into a kugel. Glamorous modern style salads are joined by pickled herring or some kind of fishy hors-d’ouvres, such as smoked whitefish salad or salmon mousse, which are especially popular in the US. But a shot of alchohol – maybe schnapps or whisky – and a slice of a simple cake like a sponge remains a popular way to end the fast before the big meal begins. Ugat Kippur – the cake of Kippur – is the sponge cake baked by Rina's French/Israeli daughter-in-law Michele. It's something Rina doesn't bake herself, and it isn't from Libya, so the fact that she is so partial to it means it must really be good! Michele makes this cake only once a year, and its comforting lightness suits a fast day. Since she is a doctor, it’s worth listening! Bake in a low / moderate oven, 160 degrees for 50 minutes. Sponge cake has a scary reputation, but I found this cake easy to make. I baked it in a regular tin and I mistakenly made it with plain flour instead of self-raising, usually a very costly mistake. But the egg whites carried the day and it rose beautifully! My oven is a little hot I realise – you’d think I’d know by now! – so it cooked quickly, and was ready before its time was up. This sponge is plain, light and lemony. Ideal fast day fodder. And very moreish. 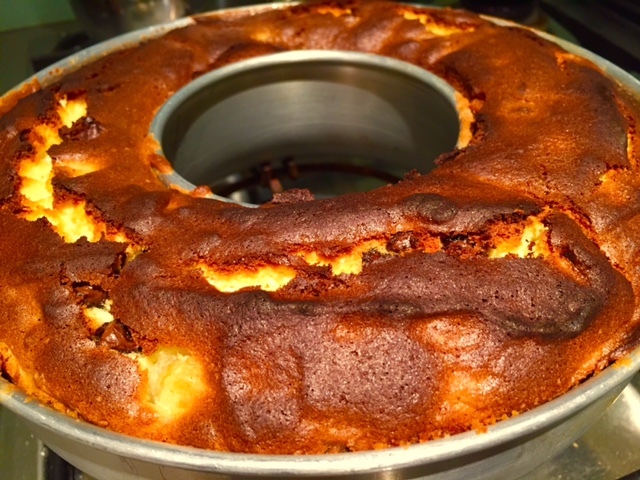 You can eat a lot of this almost fat free cake easily … I see how Grandma Rina does it! In Sydney, Judy Ingram decided to make a Gluten Free version. She used plain gf flour, since that’s what she had at home, plus baking powder. She left out the oil, and added lemon juice to the rind, as well as chocolate chips and toasted almond slivers, before folding in the egg whites. That would make it richer, and take it out of the category of cakes you’d eat before the fast, though it does sound celebratory, so it would go well at the meal afterwards! Before Amanda Hampel married into the family of Food is Love grandmother Ruth Hampel the traditional Yom Kippur cake in her mother’s house was also a plain cake. It was made with a little more oil, and also milk. It comes from a Polish great grandmother from he North of England, and has a few unusual features: you add the eggs to the mix last, and put the cake into a cold oven. 5. Place in a COLD OVEN. Put in the centre 350 F or 180 C for 1 hour or until till cooked. Test with a toothpick or skewer. Cool and wrap in foil. This was an easy cake to prepare, few ingredients, and no complicated steps. But something didn’t quite go right. It only rose a little. Am thinking it was because I made it with plain flour and baking powder, and perhaps the baking powder wasn’t fresh. It was very tasty, and I am happy that Amanda in Melbourne made a gluten free version of her great-grandmother’s kuchen which worked a treat. In fact, Amanda turned it into an almond cake. She tweaked the quantities slightly to take into account the moisture from the almond meal and maple syrup. Otherwise she followed the original instructions, including adding the eggs last. “Wow... I even surprised myself at how good this tasted!! Having been brought up on the "real deal", I must say this was absolutely delicious, and the perfect alternative as a GF version!! Half has already been devoured, doubt it'll last long here!" If you are fasting, wishing you well over the fast. And hope you have a sweet meal afterwards!